Ancient Egypt and Archaeology Web Site - Report on Aswan - history, maps, people, rock etc. Aswan is Egypt's southern most City and has a population of 150,000. In Ancient Egypt it was a frontier town just above the 1st Cataract between Egypt and Nubia. It has a fine museum, Nubian Museum ,which opened in 1998 and is partially sponsored by UNESCO. One of the famous landmarks at Aswan is the Mausoleum of the Aga Khan. It was modelled on the Fatimid tombs in Cairo, it has an open court which culminates in a Carrara marble Mihrab and sarcophagus, enshrining Aga Khan III - the 48th Imam of the Isma'ili sect of the Shi'te Muslims. The Aga Khan was, for his diamond jubilee in 1945, weighed in jewels. After his death in 1957 pilgrims flocked to Aswan, their camps posed such a health hazard the Egyptian government had to ban the mass pilgrimages. The Aga Khan was attracted to Aswan because of the climate and hot sands, which eased his rheumatism. 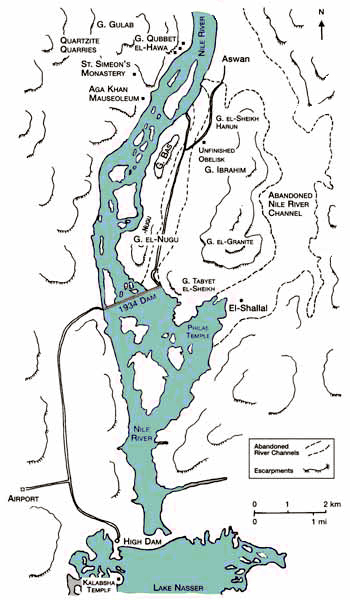 The area now known as Nubia extends along the Nile from south of Aswan to Dabba near the 4th Cataract. Nubia's name is first mentioned in Strabo's Geographia. He was a Greek who is thought to have visited Egypt in 29 BC. The name Nubia's origin is not certain but many agree that it originates from the Ancient Egyptian word nbu, meaning Gold - Nubia had many gold mines which Egypt depended on for it's wealth. However the name does not appear in any Ancient Egyptian text, which refer to Nubia as Ta-Seti, meaning "Land of the Bow." Ancient Egyptians always distinguished Lower Nubia between the 1st and 2nd cataracts (which they named wawat) from the area south of the 2nd cataract which they named Kush. The Nubians settled and lived along the Nile and were distinct from the semi-nomadic tribes who lived in the eastern dessert (between the Nile and the Red Sea). Owing to it's unique location Nubia was a major trade route through which exotic African goods reached Egypt. These included ebony, ivory, ostrich feathers and eggs and people. Nubia is rich in gold, copper and semi-precious stones such as carnelian, jasper and amethyst. "Mother" Nile is Egypt's main highway. Boats can either float or row north with the current, or sail south- using the predominant north winds. Aswan was considered the southern frontier of Egypt, since navigation was blocked by cataracts to its the south. From garrisons situated in Aswan, military missions could be launched to subdue the Nubians. Trading missions into central Africa left from and returned to this point, sending their trade goods by ship down-river to Memphis or Thebes. To make it possible for his ships to sail beyond Aswan, Merenra (ruled 2287-2278, 6th Dynasty) ordered a channel excavated through the rapids. The official he sent to supervise the task left a record of the work in his tomb, while the Merenra visited and left two inscriptions commemorating his visit. The channel had to be cleared anew in the reign of Senusret III (Khakaura, ruled 1870-1831 BC, 12th Dynasty) before he could undertake his conquest of Nubia. Thutmose III (Menkheperra, ruled 1479-1425 BC, 18th Dynasty) ordered work on the channels. This work wouldn't have involved excavation, the goal was to remove some of the boulders and sediments brought down by the annual floods. 19th century travellers found the trip through the cataract with their rented houseboats, or dahabeyas, a memorable experience. Boats were pulled or winched upstream, while the downstream ride through narrow channels filled with rushing water was hair-raising. The geological setting of Aswan is complex and there are a number of Different Kinds of Rock. Igneous and Metamorphic rocks of the deep-lying basement complex have been uplifted and exposed in this area. The river has eroded the overlying Nubian sandstone and carved deep channels into the igneous rocks. In addition to the island-choked channel of the present Nile, there is evidence for at least two other ancient, but now abandoned, Nile channels. The road leading north from the east end of the 1934 Dam follows one channel through a narrow valley between Gebel Bas and Gebel Ibrahim. Another channel lies to the east of Gebel Ibrahim, where one of the earlier, more vigorous Niles carved a vast valley. This was probably the course of the late-Miocene Eonile, since a deep gorge has been detected under the Pleistocene sediments that fill it. This valley has new residential and commercial development - a steel mill, fertilizer factory and other industries made possible by the High Dam's electric power output are located here. Many visitors are unaware of this thriving and un-attractive complex. The railroad from the north runs through the valley to the town of El-Shallal, which was formerly the port for river steamers from Aswan to Wadi Halfa. A branch of the railroad extends to the new port on the shore of Lake Nasser beyond the High Dam. Aswan's importance for the ancient Egyptians arose not only from its strategic geographic location, but also from the variety of stone that could be quarried locally and transferred easily to barges on the river. Sandstone forms the western cliffs north of the 1934 Dam and survives atop the flat-topped hills of Gebel Bas and Gebel Ibrahim. The reddish brown colour of the local sandstone is the result of the high concentration of iron compounds that oxidize on their surface. North-East of Aswan are deposits that provide iron ore for the Aswan steel mills and at Helwan south of Cairo. This source of iron ore may have been exploited as early as the New Kingdom, when the Egyptians learned about iron working from the Levant. Prior to that they may have mined the red hematite for pigments. 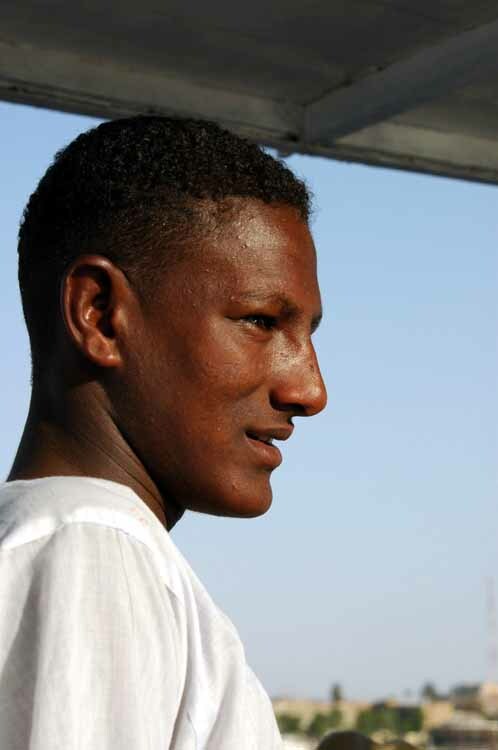 Egyptian inhabitants of Aswan have different facial characteristics. Some have strong profiles more in common with the south and are proud to call themselves Nubian. The softness of the sandstone in the escarpment of Gebel Qubbet el-Hawa on the west bank opposite Aswan encouraged Old and Middle Kingdom governors to build rock-cut tombs there. Some of the sandstone cliffs have been altered into an extremely hard quartzite. This was quarried in pharaonic times to provide material for statues and sarcophagi, several examples are in Luxor. For example, the carved sarcophagus in the tomb of Tutankhamun is carved from dark red quartzite. A large variety of igneous and metamorphic rocks are found among the numerous outcroppings of basement complex around Aswan, but only a few kinds of rock were exploited extensively in ancient times. 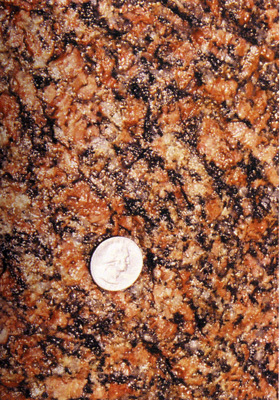 Red or pink granite and grey granodiorite are the most prominent. Nearly 100 quarrying sites have been identified on the east bank and the islands. Many natural granite boulders still lie in heaps along the roads and riverbanks. Granite was a popular stone among the Old Kingdom kings. It was used to construct the burial chamber at the Saqqara Step Pyramid in the 3rd Dynasty. 4th Dynasty kings used it lavishly in their burial chambers and in their mortuary temples at Giza. King Djedefre (Radjedef, ruled 2566-2558 BC, 4th Dynasty), Khafra (Chephren, ruled 2558-2532 BC, 4th Dynasty) and Merenra (ruled 2287-2278 BC, 6th Dynasty) had one or more courses of granite casing on the outside of their pyramids. 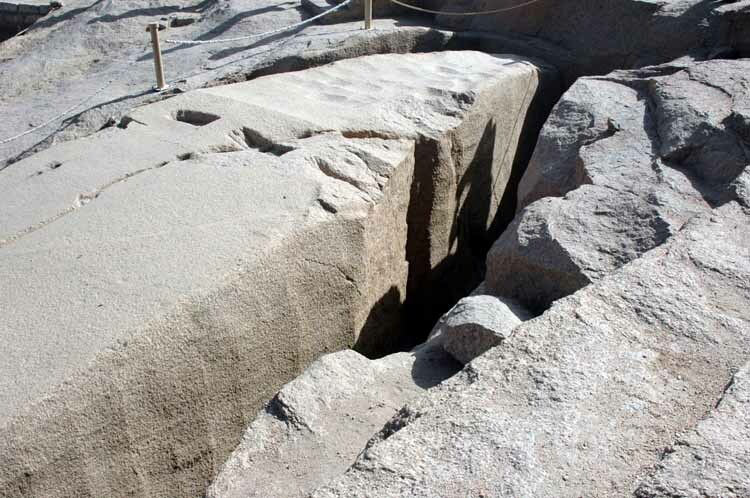 Granite was also used for sarcophagi and portcullises to seal the pyramid passageways. During the 5th Dynasty, granite portcullis chambers continued to be built in limestone pyramids. Granite was surely preferred over other stone for some of these applications because of its greater hardness. In addition, its appearance may have been a consideration. Both red granite and black or grey granodiorite were used; they take a fine polish and the colours may have had a special symbolism in certain applications. For whatever reason it was chosen over other stones, granite was much more difficult to work than either of the other far more common building materials, limestone and sandstone. Many theories abound about how the ancient Egyptians must have had advanced techniques for working hard stones and how knowledge of these techniques has since been lost. There is no evidence for any unknown methods and much evidence for the methods actually used, which mostly involved physical strength and time. Most of the granite employed during the Old Kingdom was probably not quarried in the sense of extracting a block from a great mass of mother rock. Instead naturally formed blocks were used; all that was necessary was to select a block of appropriate size, load it onto a barge for shipment downriver, and finally shape it. Judging from unfinished examples left in the quarries, preliminary shaping was done at Aswan to reduce the weight. Unfinished Obelisk - one of the red granite quarries that provided stone for Ancient Egyptian temples and statues still holds a giant and unfinished obelisk. The obelisk is roughly dressed and was in the process of being 'cut free' of the surrounding rock. A flaw in the stone developed, which is still very visible, and the work was abandoned. It is thought that this was the pair of the Lateran Obelisk, which is now in Rome, which originally stood before Karnak Temple and was commissioned for Tuthmosis III. From the chisel marks and the ancient tools found in the area, some of the ancient quarry techniques have been determined. These include soaking wooden blocks to encourage the rock to crack and also using quartz sand slurry as an abrasive. The huge effort required to free this Obelisk is staggering, especially considering the basic tools and lack of any non-manual techniques. If the piece was freed an equally monumental effort would have been needed to move it 220 Km from the Quarry to the Nile, and then to Karnak. Granite naturally weathers into conveniently-shaped boulders. Granite forms from molten magma as a great solid mass far underground. As this mass cools and solidifies it is typically under great pressure. Tectonic movements may eventually lift this mass closer to the surface. As the land above this granite mass erodes, the external pressure on the mass is reduced and the granite begins to fracture along horizontal and vertical planes at right angles-an action known as pressure release. This produces joints that define nearly perfectly rectangular blocks. Tectonic forces can also crush and fracture the rocks. Slightly below ground, in a humid environment such as Egypt experienced in times past, the blocks weather along the joints into more rounded shapes. Then when the rocks are exposed by erosion of the overburden, the blocks are revealed ready for use without the difficulties attendant to quarrying them. The role of the river is primarily to expose the rocks, but some rounding may also occur when the floodwaters sweep debris over the surface of the boulders. After selecting a granite boulder of the right size Egyptians used a number of techniques to smooth it. These included hitting it with Dolerite hammer stones and sawing or drilling using copper saws and drill bits in conjunction with fine sand. All of these would be slow, time-consuming operations, but each would eventually produce the desired results. The already jointed granite blocks probably served many of the purposes of the Old Kingdom, such as casing blocks and wall blocks in chambers and temples; even pillars and roofing beams could be made from larger stones. But when demands exceeded the size of the available boulders, quarrying became necessary. The obelisks and colossal royal statues popular in the Middle and New Kingdoms had to be derived from a larger, solid mass of rock. Evidence of the methods the Egyptians used to do this can still be seen on the famous 'unfinished obelisk' - if completed it would have been almost 42 m tall and weighed over 1,100 tons. Along each side of the obelisk are trenches formed by overlapping shallow depressions-each one revealing where a worker stood and hammered on the granite with a Dolerite pounder, a ball of stone weighing 4 or 5 kg (around 10 pounds). The reason that this obelisk was abandoned after months of work is obvious: an enormous crack stretches across the top. In the Aswan quarries, and on many sites throughout Egypt where granite was employed anciently, one can see granite blocks with a series of rectangular holes defining the line along which the block is to be split. It is sometimes asserted that wooden wedges were inserted into these holes and soaked with water until they swelled and split the rock. Recent experiments with wetted wedges show that they would not have been effective in splitting granite. The holes themselves must have been cut using iron or steel chisels, which only became available in Egypt in the Late Period and widespread in Greco-Roman times. In these classical times, iron wedges and possibly splints were used after a series of rectangular holes had been cut. Where employed, two splints (also called fins or feathers) in the form of two flat metal plates were placed into the holes, and the wedge was placed between them. The splints served to direct the force of the wedge horizontally against the sides of the holes rather than allowing it to be driven into the rock at the bottom of the hole. These methods of rock splitting are still in use today. Many of the holes seen in granite blocks on archaeological sites may date from an even more recent period and be the work of modern stone robbers. Once a granite block had been quarried, it was moved to a dock on the Nile along a series of specially constructed roadways and transferred to a boat to be floated down the Nile to a building site such as Giza. Travellers visiting Giza can look at the way in which these granite blocks were incorporated into buildings. When granite was used for casing blocks on a pyramid or to line the walls of a temple, only the block's sides, top and bottom, and front were dressed. On the backside, the softer limestone backing-stones were cut to accept the natural curves of the granite blocks. Examples of this can be seen on Khafra's pyramid, where several casing blocks remain in place, and in the Khafra valley temple and Merenra mortuary temple, although most of the granite originally placed in those temples has since been stripped away. We can also see that the casing blocks on Merenra's pyramid have been set in place with their edges reduced to the final face angle, but excess material (in fact the natural curve of the block) left in the centres. 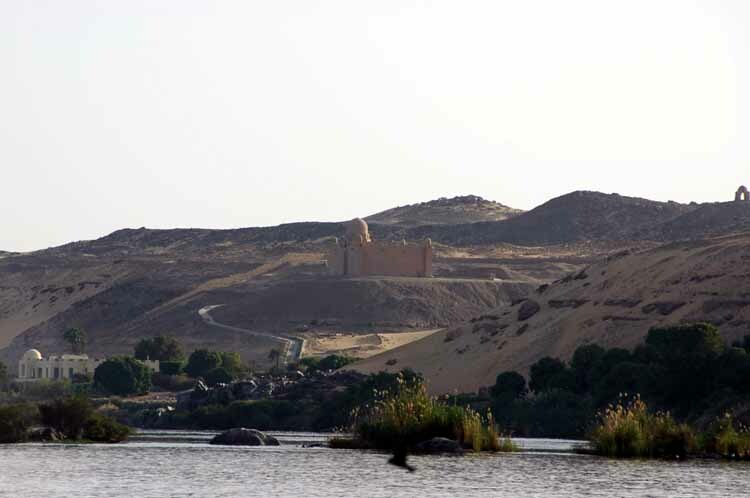 In the first half of the AD 20th century, Aswan granite was used to build the series of Aswan dams designed to store part of the floodwater for summer irrigation. The water level in the lake behind the dam rose in the late fall as the last stages of the floodwater were retained, then it dropped in the summer. The island of Philae was just upstream of the dam, and the splendid sandstone temples on it were submerged for nine months each year. In the early 1900s, methods of protecting the monuments were discussed. Removal to another site was considered, but it was felt this would destroy the essential context of the temples, so they were left in place. The fragile sandstone was reinforced, however, which turned out to be a crucial decision, since this protected the blocks against the erosive action of the water for almost seventy years. The plans for the High Dam called for the sluice gates in the 1934 dam to serve as regulators of the discharge into the river. As a consequence, the island of Philae would be permanently submerged. Again the question of how to pre-serve Philae's monuments was raised, and the plan of building a coffer dam around the island to hold out water was adopted first. It soon became clear, however, that such a dam could not be relied on and that relocation was the best solution. Nearby Agilka Island was selected as the new site; its granite peak was excavated and rubble dumped around its edges to create a topography that more closely resembled the original Philae. The more than 37,000 blocks were recorded, disassembled, cleaned of seventy years' worth of silt and organic incrustations, and reassembled in their new home. Work began in September 1975; it took eighteen months to dismantle the monuments and another two years to rebuild them. When the High Dam was being designed, it was expected that the granite outcropping above the First Cataract and in the cliffs would form an excellent impermeable substrate for the massive dam. But when engineers bored test holes into the river bottom, they discovered a huge sediment-filled gorge extending more than 250m below the modem Nile channel. In the early 1960s no one could explain how such a deep canyon had been formed. When the late-Miocene desiccation of the Mediterranean was proposed in 1970, the mystery of the Nile Canyon was solved. In order to accommodate itself to the site, the High Dam was designed as a massive rock-fill gravity dam structure. It is 980m (or almost a kilometer) thick at its base and rises 111m from the riverbed to a crest 40m wide. Its volume is equivalent to seventeen Great Pyramids. In fact, the north-south cross-section of the dam resembles a pyramid, with two wings extending upstream and downstream; these wings incorporate the cofferdams that were built on each side of the construction site. To prevent water from percolating through the sediments filling the gorge beneath the channel, a 'grout curtain' was formed by pumping cement into deep holes bored to bedrock in a line across the entire channel. The pumping pressure caused the cement to spread out and consolidate the surrounding gravels, sands, and silts. This grout curtain is 60 m thick and extends about 800m from the dam's core down to the granite bedrock. A fascinating account of the dam's construction can be found in Little (1965). The feasibility of the construction plan depended on the availability of local materials (granite and sand) and a source of electric power at Aswan. The 1934 Aswan Dam did not include a hydroelectric power plant when it was first built, but in 1961 one was constructed in it specifically to provide power for the High Dam construction project. South of Aswan and part of northern Sudan comprised the ancient land of Nubia. This desert land was sometimes dominated by Egypt, while at other times it pursued an independent course, and once, in the Twenty-fifth Dynasty, a Nubian family occupied the throne of the Egyptian. Nubians traditionally lived in small villages along the river, where they pursued agriculture, fishing, and some herding. They were also involved in the extensive trade between Egypt and central Africa that passed along the river. 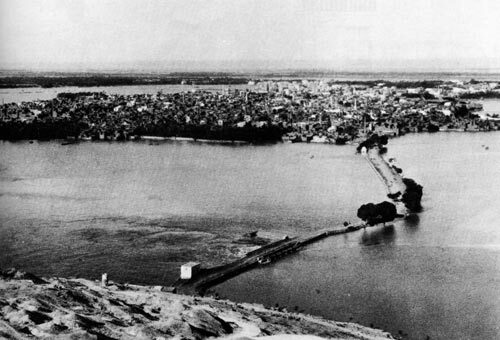 Aswan (93m above sea level) was the logical place to build dams across the Nile, since boats could not ascend farther because of the cataracts and since the floodplain narrowed significantly along the Nubian stretch of the river. The first three dams at Aswan (actually one dam enlarged two times) were only intended to store the water of one flood season and release it at the next low water. They created reservoirs with increasing heights: the 1902 dam raised a lake to 106m above sea level, the 1912 dam to 113m, and the 1934 dam to 121m. The High Dam at Aswan was completed in 1970, and since then the water of the Nile has collected to form the 500 km long Lake Nasser. The lake averages about 10 km in width, but bays extending up into former wadis make its outline very irregular. When the lake is filled to its maximum level of 175m above sea level, the reservoir holds nearly 140 billion cubic meters of water. The level rises and falls as floodwater is retained and then released over the course of the year. From 1900 to 1960, the yearly flow of the Nile averaged about 84 billion cubic meters of water, but there was considerable year-to-year variation. Based on this historical average, a 1959 treaty allotted Egypt 55.5 billion cubic meters per year from Lake Nasser and Sudan 18.5 billion; the final 10 billion cubic meters was allotted to evaporative losses. One disadvantage of the Aswan location for the High Dam is that the dry desert air evaporates a great deal of water from the surface of Lake Nasser. Yearly evaporation and seepage losses average about 10% of the volume of water in the reservoir. Seepage is expected to decline, however, as neighbouring aquifers become saturated. Since the dam traps all the floodwater, it also traps the suspended materials carried by the flood. This amounts to around 110 million tons each year. The coarse sediments collect at the south end of the lake in the vicinity of the Second Cataract, where the lake is already shallow. These sediments have accumulated to the point of emerging as islands above the surface. The designers of the dam anticipated that silts and clays would accumulate, how-ever, and allocated 20% of the lake's volume to hold them. This provision should accommodate the sediments for 400 to 500 years. The scenery along Lake Nasser is less dramatic than that of the former Nubian Nile, but one has a better view of the landscape beyond the river. The surface of the desert on each side of the Nile is a plain with an elevation of around 20m above the lake, or around 200m above sea level. This plain is deeply incised with wadis entering from both the east and the west. Beyond the first plain are two others stepping back to the west and east at elevations above sea level of 230 to 260m for the first stage and 300 to 360m for the highest level. The surface of the two lower plains is made of Nubian sandstone, while the surface of the highest plain (consisting of younger rock) is composed of Cretaceous limestone and shale. To the far west of the lake an escarpment of Eocene limestone, the Sinn el-Kaddab, marks the southeast edge of the vast limestone plateau that separates the oases of the Western Desert from the Nile Valley. These three plain surfaces at successively higher elevations are called pedi-plains and were formed by earlier cycles of erosion. A pedi-plain is an erosional surface characteristic of arid environments. Its formation can be explained as follows. Suppose one begins with a plateau at some elevation above sea level. Rain falling on the plateau will flow into streams that will begin to cut channels into the surface of the plateau. These channels will gradually widen until the plateau is dissected into a series of isolated buttes surrounded by a plain whose elevation is equal to that of the base level of the drainage-either sea level, or in this case since we are far inland, the level of the river into which the wadis drained. The isolated buttes will continue to erode by undercutting, rock falls, and wind deflation. If the base level falls, another cycle will begin with down-cutting of the plain formed in the first cycle. After several cycles of this, a series of remnant plains each studded with higher remnant peaks or tablelands will be formed. Since such a process would be very slow in a hyper-arid climate with only occasional cloudbursts, we probably have to look back to a time when the climate of Egypt was much wetter-the Pleistocene or even much earlier-to have produced the cycles of down-cutting just described. In the deserts today, the process continues slowly 'nibbling' away at the residual higher peaks. Recently the formation of the Nubian pedi-plain landscape has been linked to a proposal for a river system that preceded the Nile called the Qena River (pronounced Gena). This was a south-flowing river that existed during the Miocene from about 24 to 6 million years ago. This new proposal asserts that repeated uplifts of the region in connection with the opening of the Red Sea, rather than drops in base or sea level, maintained the elevation differential that led to the cycles of down-cutting. Several of the wadis whose mouths now form bays along Lake Nasser have interesting histories. The Kalabsha Wadi extends westward for nearly 100 km; today the lake waters penetrate about 10 km into this depression. In 1981, a magnitude 5.3 (on the Richter Scale) earthquake centred on this area raised fears that the weight of the lake's water was the cause. A study showed that the quake was associated with a previously existing east-west fault. The study concluded, however, that the Aswan High Dam could withstand any disturbance that was likely to occur. Wadi Toshka (or Tushka) is 34 km northeast of Abu Simbel. It assumed a new importance when it was decided to construct a spillway through it to divert excess lake water rather than releasing it at Aswan and letting it sweep downstream. Archaeological and geological surveys were conducted in preparation for digging the channel. It was determined that this wadi had once carried water from lakes in the Kiseiba-Dungul Depression to the Nile. Within the wadi the investigators found a channel incised into bedrock but now filled with sediment and covered with wind blown sand. The extreme depth of the channel indicated it had probably been carved during the late-Miocene Mediterranean desiccation, when the Nile was cutting its own canyon. Primitive flint implements among the upper layers of sediments indicated that humans might have lived along this stream as much as 200,000 years ago. In the 1970s, the Sadat Canal was excavated through the sediments at the west end of the wadi to open a route for excess water to flow into the Kiseiba-Dungul Depression. In September 1996, when Lake Nasser's water level reached 178m above sea level during an unusually high flood season, overflow water entered the depressions at the west end of the canal and began to form several lakes. Several more years of higher than average floods followed, so that by the year 2000 the Toshka Lakes occupied around 1600 sq km and held 20 billion cubic meters of water. Wadi Toshka may have been an important route to a hard stone quarry about 70 km northwest of Abu Simbel. The quarry lies in an outcropping of the basement complex rock and was worked from Predynastic times to the Middle Kingdom. It provided the attractive anorthosite gneiss that was used for statues such as the famous Chephren (Khafre) with the falcon on his chair in the Egyptian Museum. During the Middle Kingdom, a road consisting of a cleared pathway was constructed for a distance of 80 kilometers to the Nile Valley at Toshka. In 1997, construction of the Sheikh Zayed (former Ruler of United Arab Emirates, fiefdom of Abu Dhabi, family based in Al Ain) Canal was begun, leading from a point on the west bank of Lake Nasser just north of Wadi Toshka. This canal is designed to convey 5 billion cubic meters of water a year to the New Valley Project (now also known as the Toshka Project) in the depressions of the Western Desert. The water for the canal will have to be pumped up an average of 21 to 53m to get across the intervening section of the Nubian Plateau. Wadi el-Allaqi enters Lake Nasser from the east 125 km south of Aswan. The wadi's main channel is over 350 km in length. 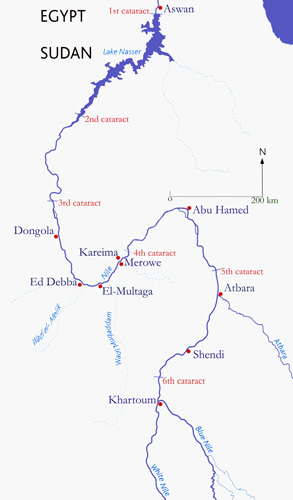 This channel and its major tributary, Wadi Gabgaba, along with hundreds of lesser tributaries, drain an area of the Nubian Desert estimated at 44,000 sq km. These must have been a major source of the Nile's water during earlier periods of wetter climates before the connection to the sub-Saharan sources (White and Blue Niles) was established. Even in these hyper-arid times, an occasional thunderstorm in the region will convert the wadi into a raging torrent. In 1830, Linant de Bellefonds, a Frenchman employed by Muhammad Ali, reported that a flood from the Wadi el-Allaqi was so strong that it prevented his dahabeya from sailing past the confluence of the wadi and the Nile. Historically, Wadi el-Allaqi was important to Egyptian society as the location of several productive gold mines. One of these at Umm Qareiyat continued to be mined into the 1900s. Lake Nasser has obliterated the original Nile Valley south of Aswan. Modern impressions of the valley's former appearance must be gained from the archaeological reports of those who conducted salvage expeditions or from the far more colourful journals of nineteenth and early twentieth-century travellers. Once south of the Aswan cataract, boats formerly cruised between high sand-stone cliffs that rose several hundred feet above the river. At Kalabsha, 60 km south of Aswan, granite cliffs appeared and constricted the gorge to a width of only 200 m for a distance of nearly 5 km. Elsewhere, narrow floodplains supported small villages and some agriculture. Travellers such as Amelia Edwards (1888) described the lively village activities, the appearance of the monuments choked by sand, and the desolate expanses of desert. At Wadi Halfa on the Egypt-Sudan border and 345 km south of Aswan, the Second Cataract began and continued for nearly 200 km. Most travellers ventured no further. All of this picturesque scenery and many archaeological sites now lie beneath the waters of Lake Nasser. In fact, the dams built at Aswan in the early decades of the twentieth century began the obliteration of Nubia. As the water impounded by these dams inundated riverbanks upstream, the Nubian villagers were forced to move their homes to higher levels or move away. When the High Dam was completed, more than 60,000 Egyptian Nubians lost their homes. They were resettled in new villages constructed for them east of Kom Ombo. Many were depressed at first by loss of their traditional homes, riverfront way of life, and the failure of some government promises to materialize. Gradually the resettled Nubians have been more content, as farming opportunities have improved. While the younger generation is becoming accustomed to the location, some of the elderly would like to move back to the riverside. Some archaeological salvage work preceded the 1912 and 1934 phases of dam building, in order to excavate and record sites to be destroyed. In the late 1950s and early 1960s, an intensive international effort was mounted to record as much as possible about sites-many heretofore unknown-that would be submerged by the expanded lake. Like the Nubian people, some monuments were saved from drowning by relocation. Since only a small number could be preserved, it must have been an agonizing choice to decide which ones to save. And once chosen, the fates of many were left hanging while a worldwide fundraising effort occurred. The most incredible effort involved the relocation of the two rock-cut temples at Abu Simbel. The project involved engineers, stonecutters, and archaeologists from around the world. The $40 million cost was covered predominantly by Egypt and the United States and by other funds raised by UNESCO. The Abu Simbel temples, built by Ramesses II to honour himself and his wife, were carved into a high cliff of Nubian sandstone on the west bank of the Nile about 280 km south of Aswan. This site is now submerged beneath the waters of Lake Nasser. To preserve the monuments, they were moved to a new site 65 m above the old one and 210 m to the west. The original temple facade was carved into a sandstone escarpment, while the interior was hollowed out of the cliff. The Nubian sandstone has many cracks and fissures in it, the sand grains being only weakly cemented together. While this made the work of carving the statues and reliefs easier originally, it meant that they were easily worn. If the temples had been placed anywhere but in an and environment like Nubia, they would have been destroyed long ago. In the salvage operation, the fragile rock was consolidated in many places prior to moving it. The temples were relocated by first removing the overburden, that is, the majority of natural rock above the temple, leaving only a thickness sufficient to serve as a 'roof.' Then the temples were cut into blocks that were removed to a storage area and later reassembled. The rebuilt Great Temple is covered by a massive concrete dome 60m wide by 27m high. Built to sustain loads of 55 tons per sqm, it is itself an engineering marvel that prevents the restored overburden from resting directly on the temple interior. Work on the move began in 1963 and was completed in 1968. In their new site, the temples retain their original orientation, so that at sunrise on October 22 and February 22 the sunlight still shines directly down the main aisle of the temple and illuminates the sanctuary with its four gods: Re-Harakhte, Ptah, Amun-Re, and Ramesses himself. Other temples, tombs, and buildings from sites along the riverbanks were also relocated. Being smaller it was possible to move them longer distances and group several together in one place to create a series of destinations for travellers cruising between Abu Simbel and Aswan. For example, a large temple with sections dating from Amenhotep II to the Romans once stood on the riverbank at Kalabsha. It was moved to a promontory just Southwest of the High Dam. This relocation process was facilitated by the fact that the temple was built of 16,000 quarried sandstone blocks and stood in the open rather than being cut into the cliff face. The success of this move provided an example during later discussions about the future of the monuments at Philae (see the next chapter). The blocks for the Kalabasha Temple, like the other temples and tombs of Nubia, were obtained at nearby sites, but these ancient quarries have also been inundated and so are not available for study. When one visits the relocated monuments, one is immediately struck by the deep reddish brown colour of the sandstone in the structures and in the surrounding hills. There are hundreds of different kinds of rock with different chemical compositions and textures. By studying rock the history of the area can be determined. For Egypt knowledge of a few types of rock is sufficient and we can classify these as igneous, sedimentary or metamorphic. Igneous rocks are formed when molten rock, called magma, cools and solidifies. 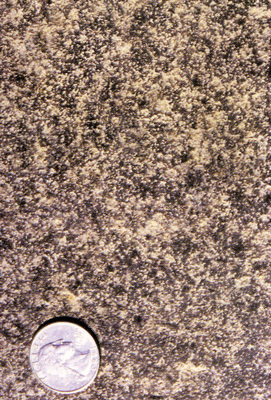 Sub-ducting plates often form magma; the molten larva rises to the surface where it cools and solidifies into Igneous rock. Igneous rock is further defined as either intrusive (below ground) or extrusive (above ground), depending whether it cools underground or above ground. Intrusive igneous rocks happens when magma cools below ground - the rate of cooling is slow enough to form large crystals in each rock. Although they are formed underground they are found on the surface by erosion or magma up-welling. Extrusive (or volcanic) igneous rock happens when magma, called lava, reaches the surface through faults that feed volcanoes. Depending on its chemical composition lava can be thick or thin, thin Lava can flow over some distance on the surface and forms sheets. Sedimentary rock types can be formed when old rocks are re-cycled by being broken up (not melted). These are transported either by wind or water until they rest in streambeds, river channels, floodplains, landlocked basins, coastal lagoons or seafloor. They can become cemented together by chemical process resulting from seawater or percolation of rain. Common rock types include calcium carbonate, silica (silicon dioxide) and iron oxide. Sedimentary rock is characterised by the size of fragment and type of cement. Sedimentary rock's properties are a function of its fragments and cement. For example, sandstone varies in the kind and quantity of cement ground, binding their sand grains. As a result they vary in their hardness, which affects how well they perform as building stone. In some sandstone the cement is weak and the individual grains separate readily from their neighbours; in others the cement may actually be tougher than the material it holds together, so a, called that when the rock breaks, it breaks across the grains. One of the most important sedimentary rocks in Egypt is limestone. Limestone isn't defined by the size of its particles but by its chemical composition: both its grains and cement are composed of the compound calcium carbonate. Calcite and aragonite are common minerals containing this compound. Limestone forms in a variety of marine environments. Many marine organisms ranging in size from giant clams and other molluscs down to tiny proto-zoa extract calcium carbonate from seawater and use it to form external shells or internal skeletons. When these organisms die their shells or broken shell fragments sink to the bottom, where they may be lithified by calcium carbonate precipitating from saturated seawater or produced by other limestone-ground secreting organisms. The texture of limestone can vary from very coarse (when shell fragments are large) to very fine (when the grains are tiny or sand- sized). Limestone is generally considered a relatively soft rock (compared to and their granite, for example), but this is a function of the amount of calcium carbon-ate cement; some poorly cemented limestone are very friable or chalky, while other types are much harder. Limestone may contain considerable amounts of sand or clay (see marl). Its purity, texture, and hardness will determine limestone's suitability for use as a building stone, for statuary, or for other purposes. Several other kinds of sedimentary rock consist entirely of minerals precipitated from mineral-rich seawater or evaporating pools; such rocks are very fine-textured. Flint (also known as Chert) is found within layers of some limestone in the form of seams or nodules. Such nodules form when silica replaces the calcium carbonate. Gypsum and halite (rock salt) are usually formed by evaporation; they consist of calcium sulphate and sodium chloride. Travertine forms when water saturated with calcium carbonate evaporates around a hot spring or in a cave to form stalactites and stalagmites. Layers of sediment are usually horizontal when they are deposited; such a layer is called a stratum (plural strata) or a bed. Younger layers accumulate on top of older layers. These two facts have been referred to as the 'law of horizontality' and the 'law of superposition' of strata and are keys to an analysis of rock origins and dating. After sediments have become cemented into stone, tectonic events such as plate collisions may change their orientation-uplifting and tilting or even overturning blocks composed of many layers. Geologists learn to recognise these disturbances and use them as evidence to reconstruct past events. Younger rocks can also underlie older ones when magma rises into older rocks: the igneous rocks will be younger than their surroundings. The study of rock strata is an important branch of geology called stratigraphy. If sediment continues to be deposited at a location and lithification (cementing) continues, the depth of the sedimentary rock will increase with time. As conditions change the kind of rock formed at a particular location will also change. For example, the kind and quantity of fragments deposit-ed by a river into an ocean depend on the conditions in its drainage basin; these conditions include the kinds of rocks exposed, the climatic conditions, the volume of water flowing, the slope of the river, and other factors. When the river meets the sea, coarse sediments, that is large particles, will be deposited close to shore, while fine particles will be carried out farther before they finally sink to the bottom. Deep basins will permit sediments to be deposited for longer periods, building up thicker layers of rock. Shallow basins will fill quickly so only thin beds result. Once they are formed, both igneous and sedimentary rocks are subject to additional processes that can change their chemical and/or physical nature. The earth's crust is subject to many tectonic forces: uplift, folding, rifting, and collisions, which cause cracks in the brittle crust. If the pieces of crust on either side of the crack move- either up and down or slide past each other it is called a fault. If the pieces do not move it is called a fracture. Fractures can form in igneous rocks as a way of relieving stresses when they cool or when pressure on them is reduced. Sedimentary rocks develop fractures as the sediments harden and shrink. Metamorphic rock is subjected to heat and pressure its nature can be altered so much that it in is placed in this third major rock class. Each original rock type gives rise to a corresponding metamorphic form. Generally the conditions required to effect this transformation are only found deep underground, where plates are colliding or when still molten magma comes into contact with surrounding rocks. The latter situation is referred to as 'contact metamorphism'. Much of the African landmass was formed during the Precambrian Eon. Three small palates (with pieces of the ancient continental crust) called cratons collided and were welded together. One of these cartons (called the Nile Craton) extended into SW Egypt - this area as the oldest rock dated to 2 billion years old. The Egypt/Africa then grew as material was added at the margin - which continued through the Phanerozoic Eon and up to today. Geologists have developed a picture of the immensely thick rock foundation of Egypt by examining rock exposed at the surface or in the walls of the escarpments along the Nile Valley as well as by studying material brought up from deep bore holes drilled to locate water or oil. That foundation can be described as a sort of 'rock sandwich' with three principal components. From deepest and oldest too youngest - these are an ancient layer of igneous and metamorphic rock known as the basement complex, an intermediate layer of sandstone and a top layer of limestone. Once the layers of rock were formed, erosion began to denude the surfaces, especially when they were exposed above sea level. Therefore, the rock that we observe on the surface of the ground is a function both of the most recent kind of rock that formed there and of which layers of recent rock were removed so that older rock was revealed. The basement complex is continuous beneath the entire country. It is only revealed at the surface in a few locations where uplift and erosion have combined to expose it; usually it is hidden beneath younger rocks. The basement complex is exposed in the far south-west at Gebel Uweinat, in scattered out-croppings in the southern part of the Western Desert, at Aswan in the first Nile cataract, in the high mountains of the Eastern Desert, and in the southern part of the Sinai Peninsula. The metamorphic rocks of the basement complex are tremendously old. Some of them have been dated by radioactive techniques to more than 2 billion years. These occur in the South-West, where the ancient West Nile craton is located. Those in the Eastern Desert and Sinai are younger, with ages between 1 billion and 500 million years. Many of these were formed during the period (estimated at 950 to 550 million years ago) when other plates were colliding with the African Plate. The metamorphic rocks are the oldest components of the basement complex, representing both sedimentary and igneous rocks that were transformed by the collisions. The igneous rocks are relatively younger than the metamorphic ones, having been intruded into the older rocks around them.